Hyperplasia of the transitional cell epithelium of the urinary bladder is a common phenomenon seen under various conditions and in different strains of rats of both sexes. Development of urothelial hyperplasia appears understandable when it is realized that very slowly renewing transitional cell epithelium is capable of intensive proliferation in response to appropriate stimuli. Pathogenetically, two main types of hyperplastic lesions need to be distinguished, differing in their prospective biologic behavior. 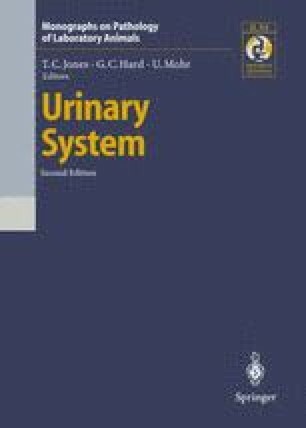 Preneoplastic urothelial hyperplasia is initiated by specific effects of carcinogens, progressively advances to a frank tumor growth, and thus plays a key role as an important developmental and transitional stage during initiation and promotion of multistep carcinogenesis of the bladder. Regenerative and reactive hyperplasia are produced by a wide variety of nongenotoxic and nonmutagenic agents affecting the urothelial cells in different ways, followed by an overcompensatory cell replication. This type of hyperplasia is reversible and returns to normal once the causative agent is withdrawn, thus lacking a preneoplastic potential.